Many rhododendron plants can become very woody, and their blooming appearance can be inhibited by the fact that they carry more numerous but smaller trusses than they did when more youthful. They can benefit from pruning and restorative maintenance. Similarly, plants which have been damaged by storm or fire need such attention. But how is it best to go about it? If you need to perform only minor repairs, in order to reshape a rhododendron, then it’s best to make your cuts just above the leaf rosettes, and new growth will emerge from the dormant eyes there. On the other hand, major surgery requires more time and keen observation of the plant. A careful inspection should reveal small bumps, which are growth buds under the bark, or swellings indicated by rings around the bark. You need to make your cuts just above these bumps or rings so the dormant buds will be stimulated into growth, and there will be a minimum of old tissue left above them to wither…. 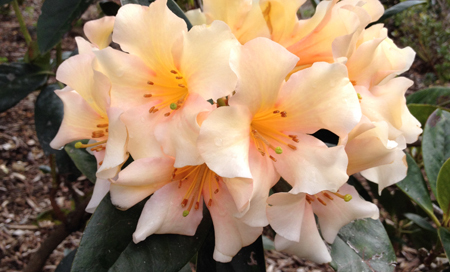 excerpt from Rejuvenating Older Rhododendrons by Laurie Begg an article in this journal on page 20.